Microsoft announced two important changes to the way it operates its Windows Phone Marketplace, and if you’re rocking a WP device, you should know that updating to Mango is a must if you want to keep on using the app catalog. In the coming weeks, Microsoft will close access to its Marketplace for all devices that haven’t been updated to Windows Phone 7.5 Mango. You’d only be able to browse the Marketplace if you haven’t updated, but you won’t be able to install apps. So why the new restrictions? Microsoft explains that the requirement for Mango is a part of an effort to improve the performance and security of its app catalog, and ensure new features could be easily implemented. Additionally, Microsoft is killing the Windows Phone apps option in Zune, and transferring the catalog features to the web. “As a general rule, we like to focus our engineering efforts where they matter most, and your taps and clicks tell us that’s our phone and web stores. So starting today we began the process of removing the Windows Phone apps option from the Zune software. The Zune HD app store will remain open,” Microsoft clarified why. Yes, I it good to force everybody to follow your only way. There is no choice what so ever if you are using WP. unlike some OS that doesn't force you to update because it doesn't exist at all! Unlike Windows If you want to really take advantage of the OS, you have to do some things yourself. On Android, you just root your phone & updating is not a problem. I learned alot more using my Android device then I ever would have, if I stuck to Windows. and what % of the android community do you expect to find it easy to root their phones? I hope you realize that is like saying "I like my old car that breaks down more often instead of a new Toyota because my old car gives me more opportunity to get into the engine and fix it." I'm not saying you are wrong to appreciate that experience, but it's not something that should be construed as a positive attribute for the product. Your quote is wrong. With Android OS, they're not going in there to fix anything. It's more like simply swapping out an engine and making the whole car experience like a new car. A phone running froyo then rooted to run gingerbread doesn't run any slower if not faster. I believe that goes the same with iPhones, cept jailbreaking the iPhone made my iExperience extremely horrible. I will take your word for it and agree with you on your last statement, cause I've never owned a WP device (altho I once wanted to when the Omnia HD came out) nor did I ever have the chance to go deep into it. However I still disagree with your comment of satisfaction on the OS. A phone is preloaded with specific OS (let's say GB as example)available at the time when the phone is produced. You can't exactly say that the phone wasn't equip with the best engine possible, because the best engine (ICS) wasn't even available at the time of production. Remember, Mango is the codename for WP 7.5, WP 8.0 is yet to come. Not to mention the HTC HD2 which was a WP, it would survive till now because of hacking and was able to run Android. If, let's say if, once WP8 comes out and MS decides to stop and won't support Mango updates to WP8. If you can hack the Mango device to run WP8 because the overall user experience would be faster, smoother, and more customizable, would you hack your Mango device and install WP8? I think the answer to the question for most of the user would be yes. Can you say that MS will continue to support Mango devices forever? No, because HD2 was a very capable device, yet it was stuck on WP6.5 with no further WP updates to newer version from MS. "Engine" shouldn't be used to reflect an OS in the first place because it's a hardware. It's just like relating Windows PC OS to a CPU, which doesn't make sense at all. @ gwuhua1984 First of all, thank you for the civil and well reasoned response. It's all too easy on these sites for conversations to devolve into pointless arguments. Again, I will admit that it wasn't the best analogy. In a proper analogy, yes, the engine would be the equivalent of the CPU and not the operating system. Regarding your example and point about what the phone comes with (GB), consider that GB was the best available version of Android when you purchased your phone. Does the GB that you received offer the best possible Android experience at the time, or are we conceding that a better Android experience is available by rooting the phone? That's what I was trying to get at; that the user experience provided with Stock WP7 is closer to being as good as the user experience with a hacked WP7 than Stock GB would be to rooted GB. This is obviously debatable. Unlocking WP7 opens up more features as WP7 is naturally a more closed system, but the core experience remains the same. I don't have much experience with rooted Androids, but from what I can tell, most people recommend it as almost necessary to improve the user experience. Android experience is base on the UI that the manufacturer put in place on the OS. Different people would prefer different UI, me for example, I would prefer HTC Sense over TouchWiz over looks. But best possible experience is probably with no sense at all, that's when the OS will run without using extra resource for the UI. Like I said, it's up to people's taste on the experience. My phone originally ran Froyo, and it was a big improvement once flashed to GB. The original experience was nice, without any complaints, but I was even happier after I got to GB. Every version of Android will provide you with the best experience it'll able to provide at the moment. It's the UI that hinders the experience most of the time, but it's just like having an active desktop on your Windows PC, it'll slow things down. Rooted Androids provide you with greater access to the internals of your device. I have my phone set to overclock to 1.8ghz when needed. However, they are people who are very satisfied with their device without rooting but by rooting the device you'll be able to do a lot more things. I have a close friend who used Android ever since G1, he loved the experience he had on his Android device with no complaints whatsoever, and he never rooted or even heard of rooting any of his devices before. After rooting his current device, he's been happier than ever. I'm sure there'll be a lot more to gain after hacking a WP device, but I've never owned a WP device myself to really play with all the hacking. 1) Toyota blows as a car manufacturer, but this is not the time nor the place to discuss that. 2) Android lets you do whatever you want to the OS, unlike WP and iOS. If you want the most current version of Android, MIUI, CM9, AOKP, AOSP, and so on and so forth, you can have it. They're all different and all have different fan bases that love whatever ROM they have. With iOS you get one version and you better like it, no matter what bugs it has. and only on android do you have to root in order to get what you pay for. So android can't offer good user experience out of the box? What a joke. Hello earwax! You got my red thumb! We say there are no choices. we think this is a failure. We ask w8 is obsolete. With Android...some phones cant upodate to the latest versions of Android due to the hardware. Some phones will never see ICS. So we will never see this happen with Android. Cant really compare this to that. I do wish Android had a higher minimum hardware requirement. But when Android was out in 2009, 2010, it had minimum hardware that was weaker than when WP7 launched. 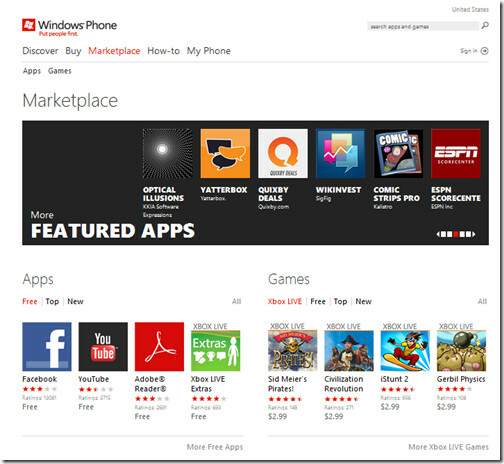 When did WP7 launch, late 2010, early 2011? An upgrade is Microsoft responsibility to make it an auto-upgrade in a handset because some people are having very hard time to used the phone, how can they have an ability to upgrade a firmware by themselves with complicated instructions. Valid concern, but misplaced. The update process is very easy; just plug the phone into your computer and the Zune software will automatically run the updates on your phone. All you have to worry about is the wait time. if you can't follow those simple instructions you don't a smart phone. An important move. I hope people will easily be able to update to Mango via PC. It's for the best. Mango is a huge improvement. Good or bad, root or not to root, it still good to have a lot of choice with Android. Myself, I have never root my phone as it serve me well until now. Now I'm thinking of upgrade to GNote just because it have the S pen for me to make drawing during working. Choice is good, both in software and hardware.